The name speaks for itself - State College is the very definition of an exciting college town. Located near the center of Pennsylvania in a rural and beautiful area, State College is home to the massive Penn State University. This lively college town offers plenty of excitement and nice places to live. Its nickname is "Happy Valley." Recreational and cultural opportunities tied with the huge and happy presence of the college abound in the area. The town itself has about 40,000 residents. The shops, restaurants, the university, and its cultural amenities make this an exciting place to live. Photo of the Central Pennsylvania Arts Festival courtesy of Wikipedia and Deeptrivia. There are active adult communities in the area (see link at top right), including one affiliated with Penn State. According to Zillow.com, the median home value was $322,500 in late 2018, but prices vary by neighborhood. 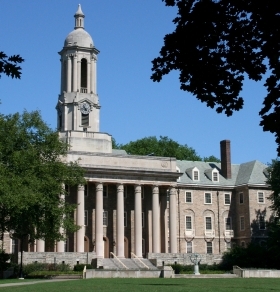 Penn State University, the home of the Nittany Lions. A great college town. State College has been rated one of the safest cities in America. Lots of traffic on game days and when students arrive on campus. It is more than an hour to a major city. State College is almost exactly in the center of Pennsylvania. The area is wooded and has rolling hills. The average July high is 81. The average January high is 32 and the low is 18. The wettest month is June (4"). There is always something going on at Penn State. The Bryce Jordan Center features cultural events of every description. The Center for the Performing Arts has ballet performances, while the Eisenhower Center and Schwab Auditorium hosts musical events. There is an annual Central Pennsylvania Festival of the Arts as well as the Palmer Museum of Art. Plus bookstores, restaurants and shops. The Osher Lifelong Learning Institute offers noncredit courses, trips, and other resources to seniors. The Central Pennsylvania Festival of the Arts. The crime rate is very low, unusually so for a large college town. State College has several medical facilities. State College has an excellent public transit system, CATA, in which seniors over 65 ride free. 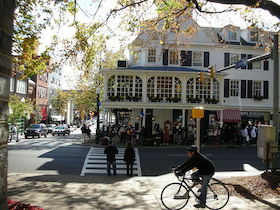 State College is a walkable community.